Coming this December is a different kind of film from Walt Disney Pictures. The studio has been known for its animated movies and blockbusters, but now they have a biographical drama called Saving Mr.Banks. The movie will look into the life of the author P.L. Travers and how her collaboration with Walt Disney captured the hearts of children and audiences around the world. There is certain to be more on the film in the months to come, but for the time being, we have the first pic from the film. The new image features the film’s stars: Emma Thompson, who will play author P.L. Travers, and Tom Hanks, who plays Walt Disney. There’s not anything real dramatic revealed in the images, but it captures the time as well as the leads’ characters. Along with Thompson and Hanks, this drama will also star Colin Farrell, Paul Giamatti, Jason Schwartzman, Bradley Whitford, Annie Rose Buckley, Ruth Wilson, B.J. Novak, Rachel Griffiths and Kathy Baker. 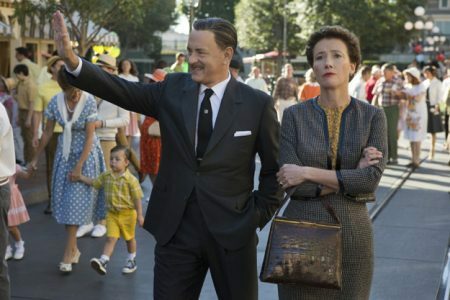 Saving Mr.Banks arrives in theaters December 13th. Can this bio-pic live up to these cultural icons? What are the dangers of Disney doing a film involving it’s own founder?